Writing as Craft and Therapy? For a long time in my professional life, I felt lost. I loved to write and I loved literature, but I didn’t love the writing world. And while writing on the one hand connected me to everything—after all, the mind can go anywhere—it also seemed isolating, restrictive and constrictive. Sitting in my chair all day, I would feel stiff and cut off. Part of the problem was that though I was a writer—which one might think would lead me to discovering my true story—I was also cut off from my authentic story. After all, in writing class, we weren’t supposed to talk about ourselves. Every writing course I’d taken was pre-professional and craft oriented. So though I could write “well,” I didn’t have the tools to uncover my authentic story or to say what I really wanted—and needed—to say. I needed to heal in order to write with a fuller vision. But the language of healing wasn’t taken seriously in the writing worlds I was in. And certainly writing towards healing wasn’t taken seriously: most writers are VERY quick to say that “writing isn’t therapy”; because if you admit that writing might be therapeutic, you run the risk of not being taken seriously. The problem is, if writing isn’t at all therapeutic, it gets cut off in a place that remains unexamined, unhealed, and, frankly, unwise. It’s not surprising. After all, we live in a world that is unhealthy, out of balance and out of alignment, and much of today’s art and writing mirrors that—and the cycle continues. I wanted to create a space that allowed writers—and non writers—to use writing as a tool to grow not only on the page but also off the page. I didn’t believe that the two were contradictory.In fact, I believed that writing to grow and writing well go hand in hand. I created Align Your Story to bring together many of the “tools” that helped me find my authentic self—yoga, meditation, deep listening—with the “craft” of writing. The unique online format allows people to practice in the comfort of their home, work at their own pace, tap into the material at the level that is right for them, and be able to come back to the material and the community time and again. In other words, the format supports really deep, personal work. 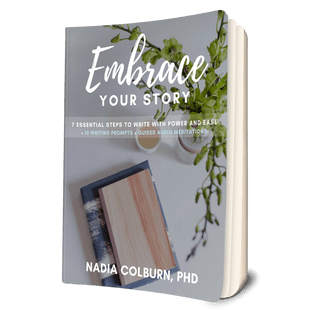 It gives you the tools to come out of the fragmentation of the traditional writing life and reconnect with the stories that your body is holding and also your inherent physical wisdom. And it gives you a supportive long-term community. Because once you join the course, you have lifetime access to the course and the community. What the course doesn’t focus on is a lot of page by page critique of your writing. If you want that editorial support—and more emotional support as well—you can sign up for the course’s premium plan. But the classic plan purposely does not focus on traditional workshopping and critique because it has been shown that when people know that they are going to share their writing, they don’t allow themselves to tell the same level of truth. We’re so outward focused in our world, that when we know that we are going to be read by others, we go into performance mode—we focus on the externals instead of the internals. The externals are important, but the externals are more beautiful, more effective and more powerful if they can come from a strong and developed internal self. I think of the story of the golden Buddha: there was a huge clay statue of a Buddha in a relatively minor temple in Thailand. One day, in the mid-fiftees, the statue needed to be moved for temple improvements. The ropes system that was moving it malfunctioned, and the statue fell on the ground, cracking open the surface. Inside was gold. As it turned out, the clay had been put around an entirely gold statue of the Buddha hundreds of years ago to protect the statue against invasions. But its value had been forgotten until the statue cracked open. Of course, this is a wonderful teaching story: when we stop paying so much attention to the surface and look deep inside, each of us has a golden Buddha within us. If you want the tools to listen to and speak from that inner golden Buddha, I invite you to join me in Align Your Story. If you want to integrate your life and create the conditions for healing, Align Your Story gives you the tools to do that. We live in a difficult, often unhealthy, often dangerous and unjust world, but we also have tools to heal, be more resilient, come into peace and be agents of change.